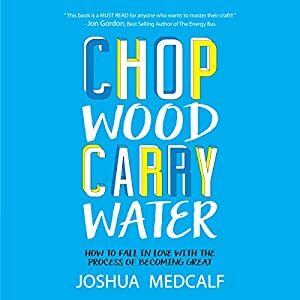 Chop Wood, Carry Water by Joshua Medcalf is a book that will change your life if you apply all its principles. In this book we follow John who as a child had a dream to be a samurai archer. As a young adult, he travels to Japan to make this a reality. Little does he realize that it takes years to become an archer, not a few weeks. In fact, he’s not even allowed to touch a bow for months. First, he had to learn to chop wood and carry water, which he did every day he lived in the complex. Chop Wood, Carry Water is a euphemism for the process, both internal and external, one must go through to be great. It’s the fundamentals. It’s the person you become in the process, while achieving your life skills. In total, John spends 10 years in Japan before he graduates as an archer. However, he has gained what most people don’t: a character that dares to do what others won’t, who works hard in the process, and someone with a purpose in life. GET THIS BOOK RIGHT NOW! GO TO AMAZON. ORDER IT. YOU WON’T REGRET IT. IT WILL CHANGE YOUR LIFE IF YOU LET IT. You could call me that. So when I tell myself to “trust the process” I feel like such a hypocrite. But in the end, that’s the only choice I have. Anything else is undue stress. Because if you want to be good at anything in life, it takes time. Losing weight and maintaining my diet for the rest of my life.